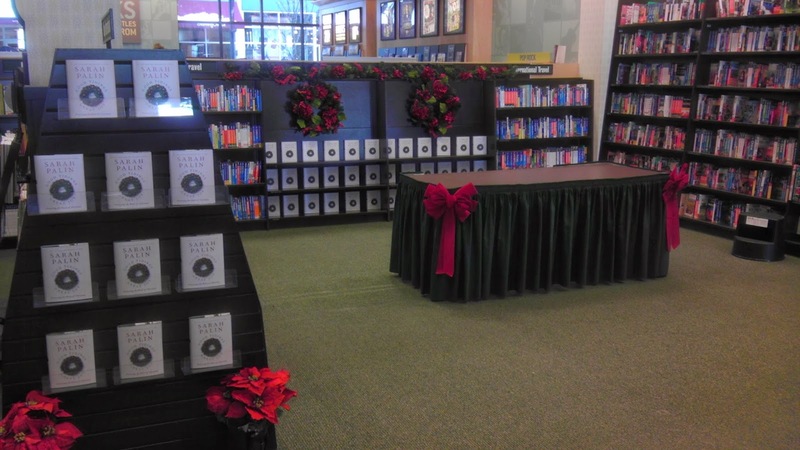 Sarah Palin’s Bethlehem Township, Pa., book signing drew more than 700 people to the local Barnes & Noble tonight. The 2008 Republican vice presidential running mate and Tea Party star greeted her fans warmly, asking children what grade they were in school and offering advice to one woman who was soon traveling to her home state of Alaska, where she served as governor. Palin didn’t pose for pictures or sign any personal messages in her new book, “Good Tidings and Great Joy: Protecting the Heart of Christmas,” but that seemed to bother few who attended the two-hour event. “She’s a doll,” said Williams Township resident Mary Hazuka, who came to the store at 6:30 this morning to secure No. 47 in line. Hazuka, who bought a total of four books, said she was pleasantly surprised to see Palin’s husband, Todd, beside her in the store. Palin specifically requested to start the tour for her Christmas book in the Bethlehem area, a local Barnes & Noble employee said last week. The store was selling Palin’s book today for 20 percent off the $22.99 list price. “You are the very, very first recipients of our whole book tour,” Palin said to the initial crowd. Shoppers were given the option of buying Palin’s book — which went on sale nationwide today — earlier in the day, obtaining a numbered wristband and then returning for the 6 p.m. signing. The store, located in Southmont Shopping Center on Freemansburg Avenue, opened an hour early today to accommodate the crowds. Long line by 8 a.m. Some eager book purchasers were already outside when the first store employees arrived at 6 a.m. By 8 a.m., there was a line outside stretching past the adjacent Pier 1 Imports. One out-of-town visitor told Palin she woke up at 1:30 a.m. to come see her. “Well, welcome to our world!” said Palin, who added that she’s constantly traveling at odd hours. Palmer Township resident Taryn Gilbert also showed up about 6:30 this morning to secure No. 33 in line. Gilbert, who attended with her mother, Gina, said their family traveled to many of Palin’s Pennsylvania campaign stops in 2008. “We were always in the front row. She said she remembered us,” said Taryn Gilbert, who along with her four siblings comprise the local group Sing for America. The family all wore red sweaters to Palin’s campaign stops in 2008, Gilbert said. Palin was last in the Lehigh Valley in October 2008 for a campaign rally with running mate John McCain at Stabler Arena in Bethlehem. Tonight, she wore her signature rimless glasses and a custom-made sweatshirt with an emblem stating, “It’s OK to wish me a Merry Christmas!” Palin’s new book — her third — advocates bringing back the religious spirit of Christmas. You’ll find a great picture gallery there as well! Earlier in the day there was a plethora of media attention given to the newly released “Good Tidings and Great Joy, Protecting the Heart of Christmas”. 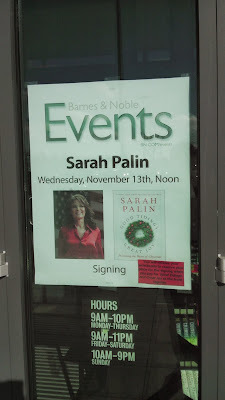 Tomorrow’s book tour will take Palin to Columbus, Ohio and Grand Rapids, MI. Tour details can be found on Palin’s Facebook page. We’re kind of “going rogue” once again back where much of an amazing adventure began. We know that a fun and worthwhile tour would not be complete without a stop in the great state of Michigan — despite what the “experts” in political circles might say! I look forward to being back in Grand Rapids this Wednesday and hope to see you there so I can wish you an early Merry Christmas! KENTWOOD, MI — Former Alaska governor Sarah Palin is kicking off the holiday season early with a West Michigan stop in her “Good Tidings and Great Joy” book tour. The 2008 Republican vice presidential candidate is scheduled to make an appearance for a book signing from 6-9 p.m. Wednesday at Woodland Mall’s Barnes and Noble Booksellers, an employee confirmed. It is Palin’s only stop in Michigan. Her newest book, “Good Tidings and Great Joy: Protecting the Heart of Christmas,” defends the importance of preserving Jesus Christ in Christmas — whether in public displays, school concerts, and pageants, or in our hearts, according to publisher Harper Collins. 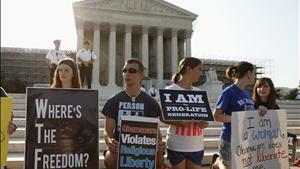 It, too, reportedly is a call to action for Christians to defend and openly celebrate their beliefs. 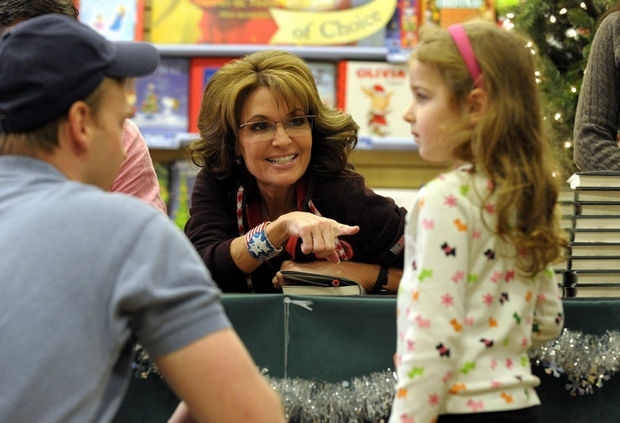 Palin previously made a stop at the same bookstore to promote her title, “Going Rogue,” in 2009. About 1,000 people waited in line for hours — some chanting, “Sarah! Sarah!” — to have their copies signed. Governor Sarah Palin sets off on another national book tour today, this time for her new Christmas book, “Good Tidings and Great Joy.” I left Adrian last night just as the snow started falling, – er, blowing – embarking on a three hour journey to Columbus, Ohio, the site of Governor Palin’s second book tour stop, tomorrow afternoon. I arrived at about 9:00 last night and am staying with a former co-worker who just recently moved to the area. Convenient, huh? This morning I traveled about half an hour to the Barnes & Noble at Polaris Fashion Center, the site of tomorrow’s book signing, to get my book – and one for a friend – and wristband, ensuring my spot in line tomorrow morning. The book became available at 9:00, and at 9:15 I was the 22nd person to get a prized wristband. I returned to the store after lunch to find that the signing area had been set up, which hadn’t been done this morning. As I write, sitting in the cafe just a few feet from the signing area, the excitement within me is building. I look forward to “meeting” Governor Palin again and sharing with her a special purely Michigan set of gifts that I’ve brought along for her. The governor will be in Grand Rapids tomorrow evening, immediately following the signing here in Columbus, and I look forward to sending her off, being the first to welcome her to the state she considers her “mini Alaska,” as she truly does have a great love and appreciation for Michigan. 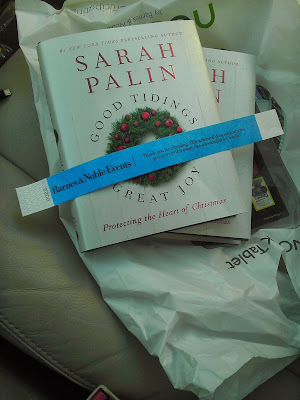 To receive a wristband you must purchase a copy of Good Tidings and Great Joy at a Barnes & Noble store or online at http://www.bn.com and present a receipt. Each wristband (person) can have up to 4 books signed by the governor. The signing begins at 12:00pm, on Wednesday, November 13, and attendees will be called to line-up in accordance with the number on their wristband. The first 100 will, obviously, be called to line-up first and will begin lining up at 11:15, according to a store representative. You can find local listings here.